The Housing Plan Update 2018 is being submitted to the voters to choose whether to adopt it as the revised 2013-2021 Housing Element Update. 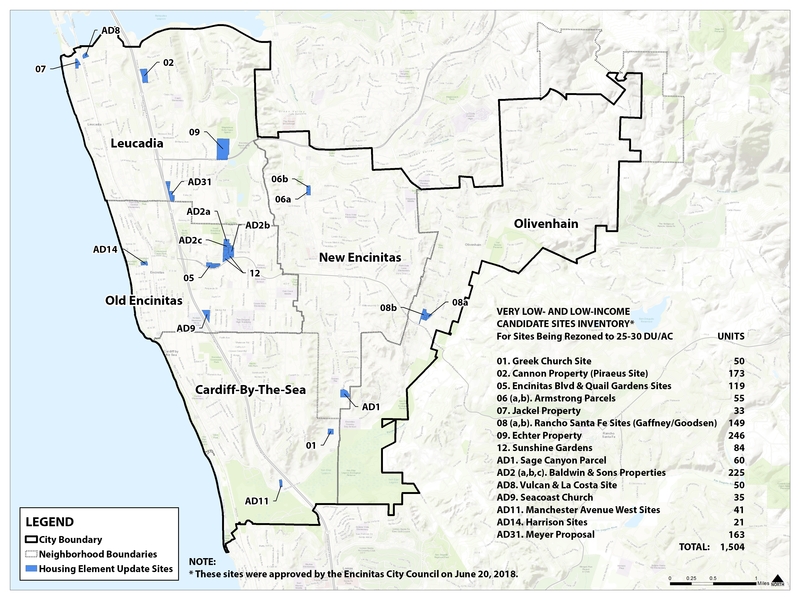 According to the proposed Housing Element draft, "The Housing Element Update provides the City with a coordinated and comprehensive strategy for promoting the production of safe, decent, and affordable housing for all within the Encinitas community." The Court ruling which addresses the petitions for writ of mandate filed by San Diego Tenants United and Lorraine Del-Rose and Building Industry Association of San Diego County was released on Tuesday, December 12, 2018. City staff has received a number of inquiries regarding Measure U from members of the public. Staff has prepared these FAQs in response and for informational purposes. These FAQs are not intended to advocate for or against Measure U. City Council approved the Housing Element Update on June 20, 2018, based on the removal of four sites (Garden View Court, Dewitt Property, El Camino Real South and Rancho Santa Fe East Site). View Draft Housing Element Update submittals to the State Department of Housing and Community Development (HCD). View Public Comments submitted to HCD and City of Encinitas Responses. Visit the Timeline webpage to view a historical timeline of past meetings with links to supporting documentation. Strategies and programs focusing on: housing affordability, substandard housing rehabilitation, existing demand for new housing, eliminating housing development constraints, and maintaining an adequate supply of rental housing. A goal of the Housing Plan Update 2018 is to ensure that the City embraces the distinct identity and character of its five communities and becomes a place where one can live their entire life with housing for all ages, incomes and abilities. The Draft Housing Element Update provides policies and programs to address these issues. The City of Encinitas envisions itself as a sustainable community that embraces its quality of life through environment, fiscal health, community health and equity. Visit the Housing Plan Update 2019 website to view current efforts related to the Housing Element. The Housing Plan Update (Measure T) website provides a summary of past efforts.